Is your water heater leaking or unable to stay lit? Call Fulton Plumbing in the Atlanta area for fast, expert water heater repair. Water heater repair or water heater installation can become things you put off for as long as possible before taking action. Water heaters go for such an extended period of time without any problems, and they are generally taken for granted. However, the sooner you call Fulton Plumbing of Atlanta, the more time and money we can save you when it comes to your water heater repair needs. This is because we have up front, honest pricing and expert knowledge. Fulton Plumbing offers fast water heater repair on all major brands and types of water heaters – traditional tank, electric, power vent and even tankless water heaters. For our commercial clients, we install and perform water heater repair on all types of water heaters and our professionals will be happy to help find the right water heater to suit the need of your business. 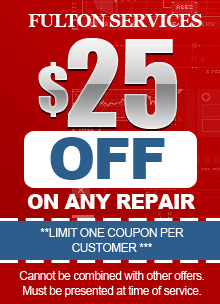 Fact: many water heaters can be repaired instead of being replaced if you do it in time! Why Call Fulton Plumbing for Water Heater Repair? 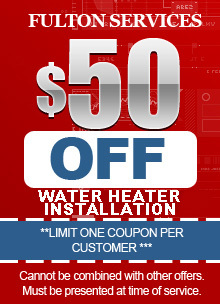 We are your local water heater installation and water heater repair specialists. Our highly-trained technicians are are the Atlanta area experts in repairing and installing tankless water heaters. We have the knowledge and skill to perform all types of water heater repair and installation. We can install all water heaters ranging from high-efficiency tankless water heaters, undersink, and point-of-use models to large commercial models, like those needed for apartment buildings. We even do mobile home water heater hook-ups. We can get your water heater installed safely and efficiently and make sure it meets all codes. All of this and more really makes Fulton Plumbing in Atlanta the best plumbing company for all of your water heater repairneeds. Water heater installation from Fulton Plumbing is definitely better. Being a locally owned plumbing company and community focused gives us the edge over any chain appliance store who promises water heater installation or water heater repair when you purchase water heaters from them. Do you really want to be surprised at who the store hires to show up at your house to do your home water heater installation or repair your water heater? Instead of calling a chain appliance store, call the best local Atlanta plumber, Fulton Pumbing, and let our quality technicians take care of your water heater repair today! To learn more about our water heater repair services, call (404) 602-0509 today! Tankless water heater installation involves removing the traditional water heater tank in your home and replacing it with an electric or gas heating unit that heats the water directly. Tankless water heater installation is also known as an “on demand” water heater. These heaters get this nickname because when a tap is turned on, only the water needed travels through the heating unit for immediate use. That means that if you are not using hot water, there is no energy wasted on heating it. On average, a tankless water heater installation can save up to 35% of heating costs if installed correctly. If you haven’t ever seen a tankless water heater installation, it may sound a little unbelievable, but a correctly sized heating unit will deliver an endless supply of hot water as it is needed. We can help you figure out whether you need a single point application water heater (for a bathroom sink), or a multi-point application (whole house tankless) water heater. Tankless water heater installation requires a licensed, qualified technician for several reasons. First of all, in order to make sure the warranty remains valid, the technician must perform the tankless water heater installation according to the manufacturer’s specifications or the warranty may be void. Tankless water heater installation may also require a permit and must meet building code requirements. As well, if you don’t buy the right kind of tankless water heater, it will not work correctly. Tankless water heater installation is not a do-it-yourself project. Let one of our qualified Atlanta plumbing technicians get you the tankless water heater(s) that will deliver the gallons per minute at the temperature you need to start saving money today! Tankless water heater installation requires figuring out exactly where in your house you are going to need hot water. Some people buy an ‘on demand water heater’ for one appliance they don’t use every day. Others, who may live in a smaller home, go for a whole house water heater. At any rate, you need to decide where the water heaters will be placed in your home and how many gallons of water they will heat per day. Most people tend to purchase a single Tankless Water Heater for their entire home. However, some people still prefer smaller Electric Tankless Water Heaters for smaller fixtures, like bathroom sinks. Do tankless water heaters require repair? Tankless water heater installation is a smart choice for homeowners because tankless water heater repair is minimal. A properly maintained tankless water heater will last up to 20 years. This is because tankless water heater repair mainly involves replacing parts that wear out. If you suspect your water isn’t heating properly from your tankless water heater, call us! We perform tankless water heater repair on most major brands.